Here is a short professional biography of the managing team behind the making of Methoda into one of the leading quality management consultants in Israel. Asher holds degrees in Economics and Statistics from Hebrew University in Jerusalem and has held senior IT positions in many organizations, including the IDF’s Mamram IT unit, Weizmann Institute of Science, and the IBM Research Center (USA), Mekhish - Bank Mizrahi's Computer Company and ILA. An expert in ALM methodologies, software development, knowledge management, and the inventor of MethodA methodology, Asher also serves as the company’s Director of R&D and knowledge management. 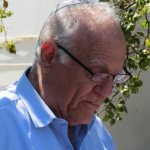 Aharon holds a degree in Economics and Computer Science from Bar-Ilan University. Aharon has over 30 years of IT experience in business and management roles, military service in IDF’s Human Resources Mechanization Center, and senior management roles in Ness. Aharon leads the Methoda’s IT management consulting practice in infrastructure, strategy, outsourcing, and business development. Haim Levi is a senior project and software management consultant, with over 20 years of IT experience. In Haim’s previous roles, he has served as a software development manager at a large software development firm, a quality assurance and information security manager at a large industrial company, and as the manager of test methodology and performance and load tests at a large telecommunications company. Haim leads Methoda’s financial sector and IT policy (subject to regulations) consulting practices and OCIO/PMO services. Yaniv holds a degree in management and computer science from the Open University. Yaniv has over 15 years of experience defining, characterizing, developing, implementing, and managing teams in project management and organizational knowledge and content management roles,using the most modern and advanced tools on the market. In his role at Methoda, Yaniv leads our division, which specializes in Atlassian tools, especially JIRA – for supporting Agile, DevOps, and Less projects, integrating organizational content management and distribution technologies, project management systems, data simulation and analysis technologies, and more. In his previous roles, Yaniv served as the CEO of Live LINX and Deputy-CEO of IFN, a member of Yael Group. Becky is one of the founders of Methoda and has been working at the company for over 20 years. When she first started, Becky handled a wide range of issues, including production and distribution of MethodA, bookkeeping, customer relations, human resources, payroll, and translation. Over the past ten years, Becky has been serving as the company’s CFO. Becky holds a Bachelor’s degree in Life Sciences (majored in Chemistry) and a Master’s degree in microbiology from Hebrew University in Jerusalem. Liat is one of the company’s earliest employees. She has been a part of the company’s development for many years. Liat holds a Bachelor’s degree in Social Sciences, with a major in Management. Liat, started out as the company’s office manager, responsible for all logistics and organizational matters, and gradually transitioned into marketing and sales, which she has been managing at Methoda for several years. In her role as Marketing and Sales Director, Liat is responsible for all of the company’s marketing and sales activities: digital marketing – defining the company’s marketing requirements and running marketing activities on the website, cross-promotion, segmented marketing, personal marketing, responding to tenders, handling opportunities, preparation of marketing materials, initiating and organizing marketing events, sales of MethodA and workshops, and more.